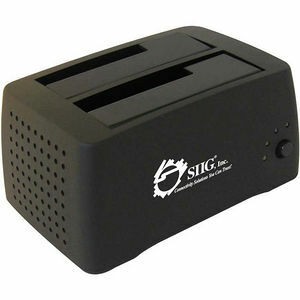 SIIG's Cool Dual SATA to USB 2.0 Docking features two hard disk drive docking bays to support 2.5" or 3.5" SATA drives along with a built-in cooling fan for lowering operating temperature to extend hard drive life. It supports Hi-Speed USB 2.0 data transfer rates of up to 480Mb/s, SATA I/II (150/300) hard disk drives, SATA II hot-plug, SATA II NCQ, plug-and-play and is hot-swappable for instant connection and removal without first powering your system off. Simply connect the Cool Dual SATA to USB 2.0 Docking to an available USB 2.0 or USB 1.1 port and enjoy fast data transfers and super convenient storage expansion that this smart tool brings to you. The Cool Dual SATA to USB 2.0 Docking is fully compliant with USB 1.1 and USB 2.0 specification and comes with a USB 2.0 cable, 5V/12V (2A) AC adapter, and comprehensive user's manual. It is also fully compatible with a wide variety of Windows and Mac OS operating systems and is backed by SIIG's limited 2-year warranty.